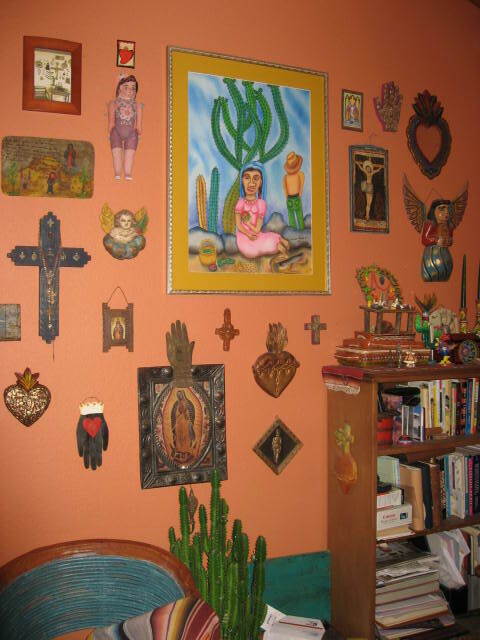 Especially in the winter months, I spend a huge share of my at-home time in my office – its southern exposure makes it the warmest room in the house, plus it gives me a blast of inspiration every time I gaze at my beloved Mexican folk art! ~ by Dawn Elliott on February 24, 2013.
it’s just so damn gorgeous! definitely a room with a “view” straight into your heart. Gorgeous Dawn. Love the room color as well. It really shows off your treasures. It would take me awhile to leave this room. So much eye candy. Dawn, this room calls me. Don’t be surprised if you see a shadow on that chair. Awesome and so is your Fashionista blog. I love it and I will be visiting. I tried leaving a comment there but couldn’t find a comment section. This is a great idea and certainly look forward to seeing/reading all about the latest for us ladies. You go girl!